Vehicles will play second fiddle to runners and bikers Sunday morning during the fifth annual Honolulu Triathlon. Portions of Ala Moana Boulevard and Nimitz Highway will be closed, and traffic will be prohibited from crossing the roads. Motorists entering or exiting the airport will have to use the H-1 freeway. 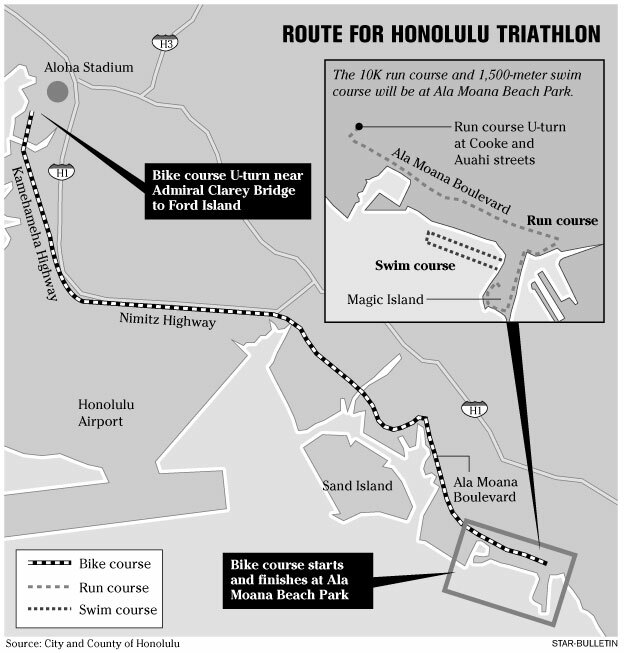 The triathlon will begin at 6 a.m. at Ala Moana Beach Park and finish by 11:30 a.m. Traffic restrictions will be lifted after the last participants pass. The state Department of Transportation will require the last bicyclists to move off the road at 10 a.m., said transportation spokesman Scott Ishikawa. "We need to make sure the road is opened up to the public at a decent hour," he said. About 1,200 participants from 12 countries will swim 1,500 meters, bike 25 miles and run 6.2 miles, with the winner taking home $30,000. Crews will begin installing cones along the roadway at 4 a.m. but will not restrict traffic crossing Ala Moana Boulevard until the start of the race. Diamond Head-bound lanes on Ala Moana Boulevard and Nimitz Highway will be closed from Atkinson Drive to Kamehameha Highway, where the bicyclists will continue and turn around at Arizona Street before heading back to Ala Moana Beach Park. Airport access via Nimitz Highway is expected to reopen at 8:30 a.m. Sand Island Access Road will be accessible from H-1, and drivers leaving Sand Island will be able to get to H-1 in both directions. Ala Moana Boulevard will close completely from Piikoi to Cooke streets during the race. Entry into Aloha Tower Marketplace's parking lot will be restricted until about 9 a.m., but parking across the street at Topa Tower will be available for $4 a day. Pedestrians can cross Ala Moana Boulevard to Aloha Tower at a controlled crossing point at Bishop Street. Before 9:30 a.m., pedestrians can use a controlled pedestrian crossing at Ward Avenue to reach the Kakaako Waterfront. After 9:30, pedestrian access will be via South Street. 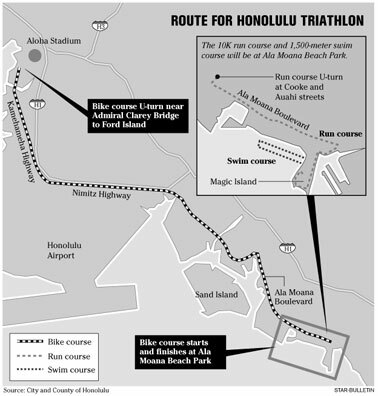 This is the second year the Honolulu Triathlon is using the Ala Moana route, after the city received more than 600 complaints about a route that went toward Hanauma Bay, said Bill Burke, director of the race. Only seven complaints were made about the new route last year. Participation is rebounding after the Waikiki sewage spill, when participants dropped to fewer than 900, he said.